Здесь вы можете прочитать биографию Нестора Махно на английском языке. Nestor Makhno (26.10. (O.S.14.10.) 1888 - 06.07.1934) - Ukrainian guerrilla leader. Nestor Ivanovych Makhno was born on 27 October 1888 in Huliaipole, Novorossiya region of the Russian Empire (present-day Ukraine). His parents were peasants and he had four siblings. It is known that his parents attempted to change his date of birth as 1889 to defer military duty. Nestor was the youngest child of the family. When Nestor was 10 months old his father died. Because of destitution Nestor was forced to work as a herdsman at the age of seven. A year later he entered the Second Huliaipole primary school. At that time Nestor worked for the landowners in the summer months. Over the years he left school and began working as a farmhand on the estates of noblemen and on the farms of rich peasants. When Nestor was 17 years old he started to work in Huliaipole as an apprentice painter. After a while he began working at local iron foundry. Afterwards he became a foundryman there. During this period Nestor Makhno became interested in revolutionary politics. His aspiration was based on his experiences of unfairness at work. Moreover Nestor Makhno protested against the terrorism of the Tsarist regime during the 1905 revolution. As a result he affiliated himself with the anarchist organization. In 1906 he was arrested and then exonerated from blame. A year later the second arrest came but the charges were repudiated. In 1908 he was again arrested when the spy was able to witness against him. Two years later Nestor Makhno was condemned to death by hanging but this sentence was cancelled and he was given life imprisonment. 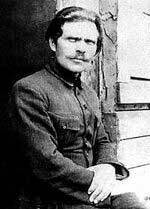 Nestor Makhno was put in Butyrskaya prison where he was influenced by Piotr Arshinov. Arshinov undertook the ideological preparation of Makhno. Following the February Revolution in 1917 Makhno was dismissed. Nestor Makhno married two times. In 1917 he married Anastasia Vasetskaya. She had a child by him, but he died a week after birth. His second marriage was to Agafya Kuzmenko with whom he had a daughter, Yelena. Nestor Makhno went down in history as a commander of the Anarchist Black Army. A partisan campaign during the Russian Civil War was led by Makhno. He supported the Bolsheviks, the Ukrainian Directory, the Bolsheviks again, and then began to organize the Free Territory of Ukraine, an anarchist society, but this idea was broken off by the consolidation of Bolshevik power. In 1925 Nestor Makhno moved to France where he spent the last years of his life. In 1934 he died of osseous tuberculosis in Paris. His ashes are in Pere Lachaise Cemetery.